The North Atlantic, like all oceans, is trackless and free, a no-man's body of water beset by storms and ice in the winter and storms and fog in the summer. This mighty ocean has been made safe for travel by the genius of man. Yet in his frailty man must take care, for despite all the electronic wonders devised through the years of scientific progress, periodically the sea take its toll. My name is Anthony Grillo and I was three years old when my mother dropped me from the side of the Andrea Doria and I landed in a blanket on a waiting lifeboat. Over the years I would look at the scrapbook of pictures and read and re-read Alvin Moscow's book, Collision Course. My mother and I would mark the anniversary of the sinking by remembering the day it happened. A web site was needed to keep the Andrea Doria alive. Stay awhile and follow the stories and pictures of sinking of the Andrea Doria and the Greatest Sea Rescue in history. Major funding for this web site is provided by the Nautical Research Group, Inc, a consulting firm that provides full service research, exploration and analyses on global maritime shipwreck disasters for media and educational-related projects utilizing a variety of nautical experts, and from visitors like you. What's New: A listing of new information that has been added to the web site in the last six months. The Ships: Information about the ships involved in the collision and rescue. The Officers: Background information on the captains and other officers involved in the collision and rescue. The Souls: Lists of passengers and crew and other personnel that were involved in the collision and rescue. The Events: The chronological events that start with the Andrea Doria leaving Genoa. This section is under construction and new information is constantly being added as new information arrives. Deck Plans: Deck by deck diagram of the ship including passenger cabin numbers. The Deep: Two days after the sinking the first scuba divers explored the Andrea Doria. Other diving information will be available here. Artifacts: Various items that survivors kept or divers found from the Andrea Doria. Recollections: Newspaper accounts and personal recollections from the survivors themselves may be found here. Survivor Reunion: Information on future survivor reunions along with information on past reunions. 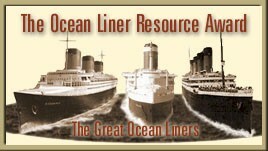 Links on the Web: Links to other web sites that have information related to ocean liners. Projects: From books to building models, information about the Andrea Doria will be found here. Online Store: Please visit our online store for Andrea Doria merchandise. All proceeds support the operation of this web site.